Last weekend the Streets Department added bike lanes on two blocks of 30th Street between Market and Walnut Streets. The block between Chestnut and Market Street is one way southbound. 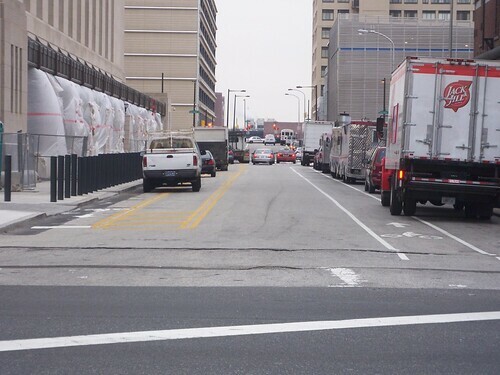 The City engineers recognized this and added in a contraflow (northbound) bike lane to allow cyclists to avoid using merge crazy Schuylkill Avenue to get to 30th Street Station and the IRS. It's the first official contraflow bike lane in the City and is another innovative design borrowed from progressive bike friendly cities. Imagine the warm feeling in my heart when I saw that Philly drivers took to the bike lanes immediately. And it was quite a diverse group - Police cars, city trucks, Penn buses, delivery trucks, some guy dropping off his significant other, private contractors and those just stopping for the newly relocated lunch trucks. Unlike some of those progressive bike friendly cities Philadelphia lacks an ordinance that specifically prohibits parking in bike lanes. The best place to put in a provision is in section 12-913 of the Philadelphia Traffic Code. Recommendations to the traffic code are already located in the Pedestrian and Bicycle Plan and the BCGP is exploring ways to move traffic code reform forward. Really? So they can't even ticket people for this? Its nice they put the lanes in but the south bound lane is always full of food trucks. If they want that northbound lane to work well, it will need to be divided. Only some sort of raised median on the buffer will prevent this. "the BCGP is exploring ways to move traffic code reform forward." Perhaps the BCGP would like to share with the rest of us what steps they are taking. Instead of a vague and non-specific statement. "Only some sort of raised median on the buffer will prevent this." +1, although enough people park on curbs in Philly. this can't be the first contraflow bike lane in the city... there's a short section on east/northbound civic center blvd between convention ave and east service drive next to the pearlman center/HUP. Check out our new mCenter report "Challenging the King of the Road: Designing for Bicycles in American Cities" by Danish Visiting Scholar Jacob Bjerre Mikkelsen, which offers a new contraflow bike lane design for 34th St in West Philadelphia. Please feel free to distribute the link!